Sky News uses LiveU cellular bonding technology for elections. Amsterdam, September, 2015: LiveU, the pioneer and leader in IP-based live video services and broadcast solutions for acquisition, management and distribution, has announced that its technology was central to Sky News’ world record beating UK General Election coverage on May 7th this year. The UK broadcaster has confirmed that it set a new Guinness World Record for the most concurrent live web streams for an event – streams fed from 138 locations to cover 150 constituency results. LiveU supplied 138 units for the coverage – including comprehensive testing - to allow the broadcaster to bring what was predicted to be a very tight election to its viewers. Sky News described its coverage at the time as “the most ambitious and wide-ranging results service available and will ensure customers have the most up-to-date information as it happens”. 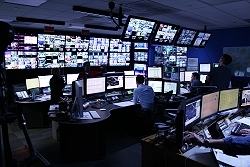 This included a specially created studio at Sky News’ Osterley location. LiveU units were managed and controlled by LiveU Central, the unified, cloud-based management platform, which enables fleets of units to be centrally controlled using geo-location capabilities alongside a host of other management options. LiveU cellular bonding technology has already changed the way that elections are covered around the world, including last year’s Indian general election as well as those in Sri Lanka and also the 2015 Greek election. Richard Pattison, Deputy Head of Technology at Sky News, said: "Getting the confirmation email was fantastic and an enormous relief. I had to provide a great deal of evidence to the Guinness World Records team to validate the attempt so I was slightly worried that what evidence we had might not meet their stringent criteria, but in the end it only took them a couple of days to ratify the attempt, which is great news."